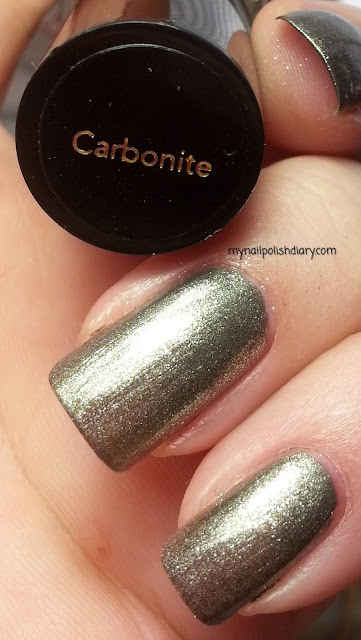 Revlon Carbonite is supposed to be a dupe for Chanel Graphite. It may or may not be. I don't have Chanel Graphite or for that matter, any Chanel polish so I can't compare. It is, however very pretty. It's a dark silvery grey metallic with silver and what look like gold and maybe some dark grey sparkles. It's a stunner! I think it will be a winter polish for me for now on though. Last time I wore it with a black outfit and that looked great. Not so great with my summer clothes though. So winter it is!